Abstract—Construction activities contribute a significant source of airborne particulate matter (PM) which causing substantial impact on air quality. This study is conducted to investigate the ambient particulate matter concentration at the construction jobsite for newly shop lot 5-storeys building in Kota Kinabalu, Malaysia. The study focusing on coarse and fine airborne particulate sizes which involved PM0.3, PM0.5, PM1 and PM2, thus to evaluate the meteorological factors namely on relative humidity, temperature and wind speed around the construction site during construction activities on PM concentrations. The study is carried out within two different construction phases to evaluate the PM emissions that sourced from the construction activities. Phase 1 is the preliminary stage of the project plan where site preparation activities are carried out, while Phase 2 is the early stage of the project plan where the superstructure construction activities will be involved. Results showed that the concentration of particulate matter collected in Phase 2 is found higher than in Phase 1, as more extensive construction activities are being carried out in Phase 2. The meteorological conditions including temperature, relative humidity and wind speed are also found to be able influenced the characterization of PM according to their sizes. Mitigation and controlling measures to alleviate the emissions of construction activities can be adopted and improved in order to reduce the atmospheric pollution that elicited by PM. Index Terms—Airborne particulate matter (PM), construction activity, coarse and fine particulate size, PM0.3, PM0.5, PM1, PM2. Carolyn Payus and Lai Yu Mian are with Faculty of Science and Natural Resources, Universiti Malaysia Sabah (UMS), 88400 Kota Kinabalu, Malaysia (e-mail: cpayus@gmail.com). Norela Sulaiman is with School of Environmental and Natural Resources, Faculty of Science and Technology, Universiti Kebangsaan Malaysia (UKM), 46300 Bangi, Selangor Darul Ehsan, Malaysia (e-mail: norelaganun@gmail.com). 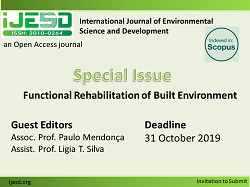 Cite: Carolyn Payus, Lai Yu Mian, and Norela Sulaiman, "Airborne Fine Particulate Emissions from Construction Activities," International Journal of Environmental Science and Development vol. 8, no. 7, pp. 526-529, 2017.